From the outhouse to the penthouse! What a difference two games can make in a 16 game season. A victory on Thursday puts Dallas in front in the NFC East. Wasn’t long ago that I was having a very hard time watching the offense struggle and wasting solid defensive efforts. I’m still deeply concerned with the offense, while having great expectations for the defense. Going into the game against Atlanta, there was a sliver of hope coming off the home win against Philly on the road. A game in which Zeke tore up the Philly defense. Which team would we see going forward? Could the Boys deliver again? It was a great victory in Atlanta, led by the defense and that was crucial, in a game where the offense struggled to find their legs early. The Cowboys trailed 6-3 at the end of the first half. Honestly, my stomach was churning watching them failing to capitalize on their first drive. A beautiful 34 yard screen play to Zeke set them up for an early scoring opportunity to only have Beasely let one slither through his hands in the end zone. Those were the highlights for the first half offensively, otherwise they struggled in executing their offense. Fortunately, the Boys defense got on the plane and were ready for this contest. If you are familiar with my one liner in assessing a team, its about the defense. No D, No Rings. This team has the chops defensively, but you can’t have an offense that struggles week after week. But they’ve found perhaps enough to make some noise, but they have to gain that consistency. The first half didn’t show us anything near what we need. The second half, they starting feeding the ball to #21 & 19 and it ultimately paid dividends. They started the second half by doing enough to get those two involved and tying up the game at 6-6. Atlanta rallied to nudge ahead 9-6 on their next possession. On the ensuing possession they called on Zeke 7 times to run the rock. One was a fumble but the right jersey jumped on the ball. 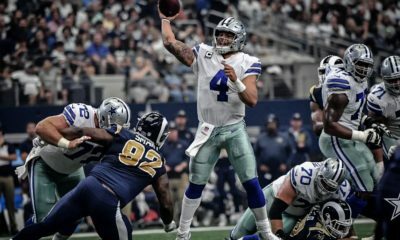 It enabled Dak to punch it in calling his own number on a real gritty physical run to move Dallas into the lead. A terrific 14 play drive using 7:53 on the clock. Unfortunately, Mr. Maher pushed one outside the upright on the right and blew the PAT. In a tight game you just know that it will have an impact and it did as the game moved on. Nonetheless, it was now a robust 12-9 lead for the good guys. The next possession for Atlanta was the clear turning point in the game and it was the Dallas defense that rang the bell. A pass intended for Calvin Ridley fittingly caromed off his hands into those of one, Leighton Vanderesche, which he returns 28 yards to the Atlanta 37. From there it didn’t take long, Zeke for 7 and Zeke for 28 and a TD. Nice turn of events with 13 points (not 14) in 41 seconds! Atlanta inched closer with their 4th FG of the game, drawing within 7 with a score of 19-12 roughly midway thru the 4th quarter. Dallas’s possession fizzled leading to a punt deep in Atlanta territory only to have Lance Lenoir crunch the returner when he was already out of bounds. Easy call, dumb on his part and moved them into decent field position. Atlanta capitalized and tied it up at 19. Not having that point after converted earlier, meant that the Falcons could tie it up with a conversion of their own, instead of forcing them to go for 2 points and giving the defense a shot at thwarting that effort. Fortunately, Dak made a crucial first down on third down with a pass to Michael Gallup for 12 yards, to keep the drive alive. Another Zeke run of 10 yards had them knocking on FG range. Dak got the ball to Cole Beasley for 11 wonderful yards to put them in position. 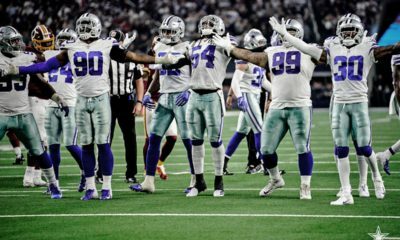 Zeke burnt three downs and Atlanta time outs while positioning the ball for him to knock it through the uprights for the game winner, which he did. From goat to hero in thirty minutes! Came across this short clip of the sidelines being mic’d up. Sure you’ll enjoy this! 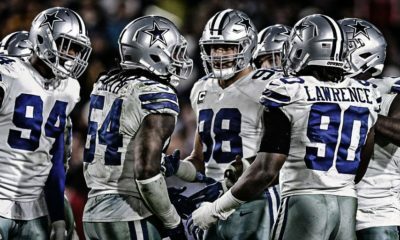 When you want to know how and why the defense is succeeding this year, look closely at the work of Demarcus Lawrence. His pressure and that of his teammates this year is more consistent than in years past. If one isn’t bringing the pressure, it can be Gregory, Tyrone or Jaylon. This Cowboy resurgence is being defined by the defense. 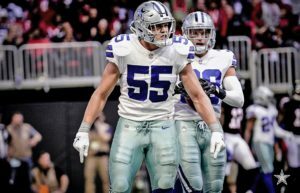 Once upon a time without Sean Lee the Cowboy defense would be in shambles. 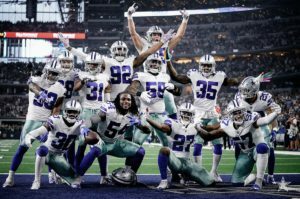 Lee’s struggling with those hamstrings this season and these two young cats, LVE and Jaylon Smith are making his absence pretty much a non factor. As good as Smith is, LVE has in a short time become a playmaker and a difference maker at a very high level. In that clip above, Zeke was calling on LVE to “make a play” and the young man delivered. I’ve not written much about the secondary, but they’ve been very good. Even on the single TD to Julio late in the game, Chido was all over him. Took a great ball in a great spot, to a great WR to make the play. Tip your cap, but Chido was in good position. Byron Jones, seems to be the talk of the league in terms of his coverage this year as being at a shut down corner level. Makes you wonder why when they drafted the young CB why it took until his 4th season before sliding into his natural position. Wanna shake your head on that decision? Anthony Brown has been very consistent as well in the slot and its keeping a really good player from the starting lineup in Jordan Lewis. He plays really well when his number is called too. Some people ripped Heath after Megatron made him look bad a few years back, but he’s been rock solid as a starter. Woods is developing nicely in keeping teams from beating us down the seams as they had in prior years. Check out LVE & Jaylon in this film breakdown by former Cowboy, Brian Baldinger. Linebackers @thejaylonsmith and @VanderEsch38 have a strong connection and are a dominate pair on the field. Hear about how they’ve both stepped up to fill in for Sean Lee during his injury. Here’s a play we’d all like to see on Thanksgiving Day in Dallas on Thursday! Our condolences to the Gallup family following the loss of Michael’s older brother. For old time Dallas fans, here’s one from the archives of one of the great win’s over the Redskins in 1979. A comeback for the ages. Enjoy the tape of some of the Dallas greats out there almost 40 years ago. Now this Thursday we’ll be facing a badly beat up team. They’ll be without Alex Smith under center and their offensive line has taken several hits as well. For Dallas, we have Geoff Swaim out with a broken wrist. Tyrun was injured in the Atlanta game but appears to be ready to go, so we’ll have to hope for the best. Just because Smith is not in this game, don’t go to sleep saying, its just Colt McCoy. Four years ago he got one of his few NFL starts and dealt the Cowboys a loss in OT. Don’t take this for granted by any means. 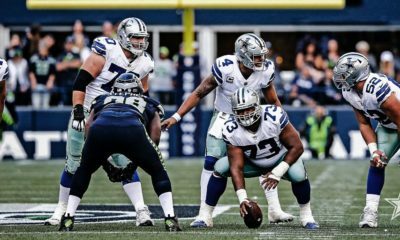 They stymied Zeke in that game a few weeks ago and that meant the game was on Dak to deliver. I’d expect them to use a similar game plan defensively to control Zeke. But the man’s a beast and after the changes in personnel and philosophy, we may not be the same team up front that they got the better of in Washington. Five minutes to play. '79 NFC East title on the line. I’ve stood by Scott Linehan as a play caller because I’ve seen him call numerous great games. A coordinator is a genius when a team wins, but is ripped when the team doesn’t. Well two victories and nary a word about his play calling, nor should there be. When Zeke rips off games of 150 and 120 yards on the ground, everyone is happy. It comes down to execution and of course mixing things up. They ran against Atlanta on downs, that the Falcons anticipated runs, to no avail. We need that same execution this Thursday. A repeat of the inept running game in Washington cannot be repeated and still cruise to victory. Hopefully, the roll continues and we not hear the name Scott Linehan for a few more weeks. Since I stopped giving you the reasons and expectations for victory, we’ve won two in a row! Therefore, I won’t tell you we have this one. But I will tell you, I think Washington leaves Dallas crying their eyes out. That’s how it should be for the Redskins, the team I learned to dislike the most, thanks to Coach George Allen.